NOTE: The information on this post may be outdated. We recommend looking into the up-to-date documentation at trac (internal) and ReadTheDocs. 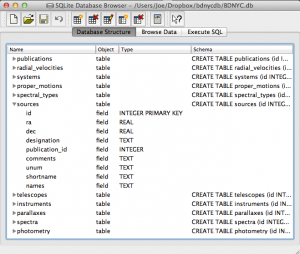 The astrodbkit package can be used to modify an existing SQL database (such as The BDNYC Database) but it can also be used to create and populate a SQL database from scratch. Note new_table=True is necessary to create a new table. Otherwise, it looks for an existing table to modify (which you could do as well!). 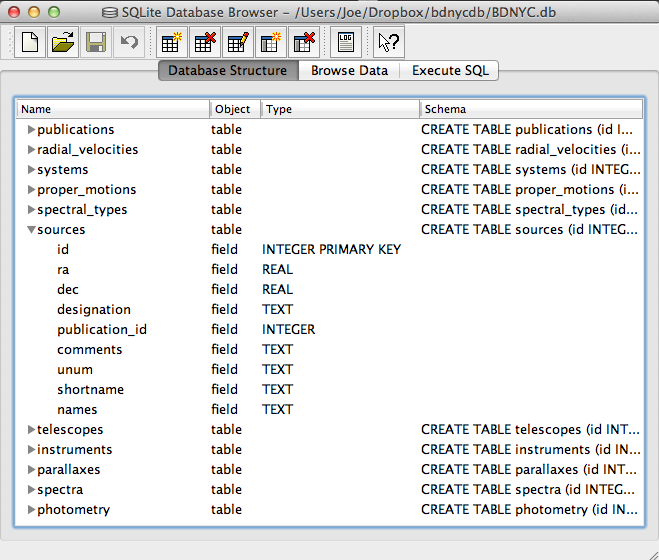 To populate your new database with data, read the documentation here or a summary at Adding Data to the BDNYC Database. As always, I recommend the SQLite Browser for a nice GUI to make changes outside of the command line. As you make changes to the astrodbkit repository on Github, you may find that the documentation needs updating. Luckily, we use the invaluable Sphinx and the awesome ReadTheDocs to generate the documentation so this is fairly simple. First, make sure you update the appropriate doc strings (those informative green bits just below the function definition) as this is what Sphinx will use to generate the documentation! git commit -m "Updated the documentation for methods x, y, and z." All set! Refresh the page (after a few minutes so ReadTheDocs can build the pages) and make sure everything is to your liking. Well done. And just in case, here's a great tutorial for getting started with Sphinx and here's the official documentation. So you've made some cool new improvements to your Python package and you want to deploy a new release. It's just a few easy steps. After your package modules have been updated, you have to update the version number in your setup.py file. The format is major.minor.micro depending on what you changed. For example, a small bug fix to v0.2.3 would increment to v0.2.4 while a new feature might increment to v0.3.0. Then make sure all the changes are committed and pushed to Github. To add data to any table, there are two easy steps. As our working example, we'll add some new objects to the SOURCES table. First, you must choose a delimiter, which is just the character that will break up the data into columns. I recommend a pipe '|' character since they don't normally appear in text. This is better than a comma since some data fields may have comma-separated values. The first line must be the |-separated column names to insert/update, e.g. ra|dec|publication_id. Note that the column names in the ascii file need not be in the same order as the table. Also, only the column names that match will be added and non-matching or missing column names will be ignored, e.g. spectral_type|ra|publication_id|dec will ignore the spectral_type values as this is not a column in the SOURCES table and input the other columns in the correct places. If a record (i.e. a line in your ascii file) has no value for a particular column, type nothing. E.g. for the given column names ra|dec|publication_id|comments, a record with no publication_id should read 34.567|12.834||This object is my favorite!. which is the oft used "summing in quadrature." Here's a step-by-step tutorial on how to set up your Python development environment. The first step is to install Anaconda. Click here, select the appropriate version for your machine and operating system, download the .dmg file, open it and double-click the installer. Make sure that when the installer asks where to put the distribution, you choose your actual hard drive and not some sub-directory on your machine. This will make things much easier later on. What's nice about this distribution is that it includes common plotting, computing, and astronomy packages such as numpy and scipy, astropy, matplotlib, and many others. Next you'll need a C compiler. If you're using MacOSX, I recommend using Xcode which you can download free here. (This step may take a while so go get a beverage.) Once the download is complete, run the installer. For future installation of packages, I recommend using Pip. To install this, at your Terminal command line type sudo easy_install pip. Then whenever you want to install a package you might need, you just open Terminal and do pip install package_name. Not every package is this easy (though most are). If you can't get something through Pip just download, unzip and put the folder of your new module with the rest of your packages in the directory /anaconda/pkgs/. Then in Terminal, navigate to that directory with cd /anaconda/pkgs/package_dir_name and do python setup.py install. MacOSX comes with the text editing application TextEdit but it is not good for editing code. I strongly recommend using TextMate though it is not free so you should ask your advisor to buy a license for you! Otherwise, some folks find the free TextWrangler to be pretty good. Next, you'll want to get access to the BDNYC database. Detailed instructions are here on how to setup Dropbox and Github on your machine in order to interact with the database. Now to use Python, in Terminal just type ipython --pylab. I recommend always launching Python this way to have the plotting library preloaded. WARNING: The information on this is outdated. We recommend looking into the up-to-date documentation at trac (internal) and ReadTheDocs. where id is the source_id. Now that you have the database at your fingertips, you’ll want to get some info out of it. To do this, you can use SQL queries. Here is a detailed post about how to write an SQL query. This will print a list of each table, the possible fields, and the data type (e.g. TEXT, INTEGER, ARRAY) for that field. Even easier is to use the DB Browser for SQLite pictured at left which lets you expand and collapse each table, sort and order columns, and other fun stuff. It even allows you to manually create/edit/destroy records with a very nice GUI. IMPORTANT: If you are using the private database keep in mind that if you change a database record, you immediately change it for everyone since we share the same database file on Dropbox. Be careful! Always check and double-check that you are entering the correct data for the correct source before you save any changes with the SQLite Database Browser. So in our students table, the fields are [id, first, last, grade, GPA], and there are a total of four records, each with a required yet arbitrary id in the first column. Or equivalently, we can just use a wildcard "*" if we want to return all fields with the SQL query "SELECT * FROM students". Notice the first student had a GPA less than 3.1 so he was omitted from the result. So students.id=quizzes.student_id associates each quiz with a student from the students table and students.last='Einstein' specifies that we only want the grades from the student with last name Einstein. That's it! We can JOIN as many tables as we want with as many restrictions we need to pull out data in the desired form. Here I want to calculate some photometric points from spectra for comparison with published values for a bunch of known brown dwarfs. In order to get the true magnitude for an object, I first need to calculate the instrumental magnitude and then correct for a number of effects. That is, I calculate the apparent magnitude from a particular place on the Earth and then add corrections to determine what it would be if we measured from space. Where is the energy flux density of the source in units of [erg s-1 cm-2 A-1] and is the scalar filter throughput for the band of interest. Since I will be comparing my calculated magnitudes to photometry taken with photon counting devices, the factor of converts to a photon flux density in units [photons s-1 cm-2 A-1]. Just as we obtained our instrumental magnitude above. Where is the extinction coefficient for the band of interest and is the airmass. The airmass is the optical path length of the atmosphere, which attenuates the source flux depending on its angle from the zenith . Approximating the truly spherical atmosphere as plane-parallel, the airmass goes from at to at . At zenith angles greater than that, the plane-parallel approximation falls apart and the airmass term gets complicated. Where and are the magnitudes below and above the atmosphere respectively. 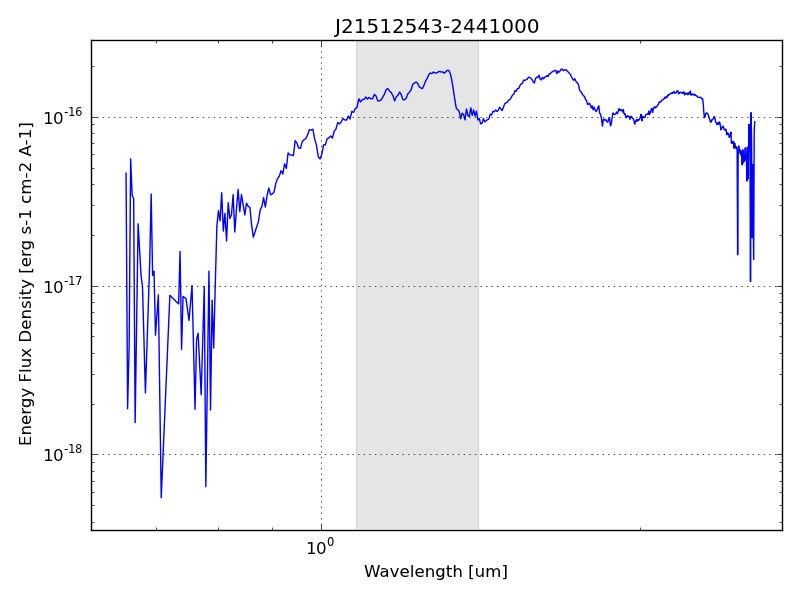 As an example, I'd like to calculate the 2MASS J-band magnitude of the brown dwarf at 21h51m25.43s -24d41m00s given a low resolution NIR energy flux density from the SpeX Prism instrument on the 3m NASA Infrared Telescope Facility. Interpolating the filter throughput to the object spectrum and then integrating as in the equation above, I get as my instrumental magnitude in the J-band. Performing the same procedure on the flux calibrated spectrum of Vega, I get for my J-band zero point magnitude. Checking the FITS file header, I will use for the airmass. The mean extinction coefficient for the MKO system J-band is given as in Tokunaga & Vacca (2007), making the atmospheric correction term . Which is only 0.007 magnitudes off from the value of from the 2MASS catalog. As shown in the example above, this works... but not for every object. 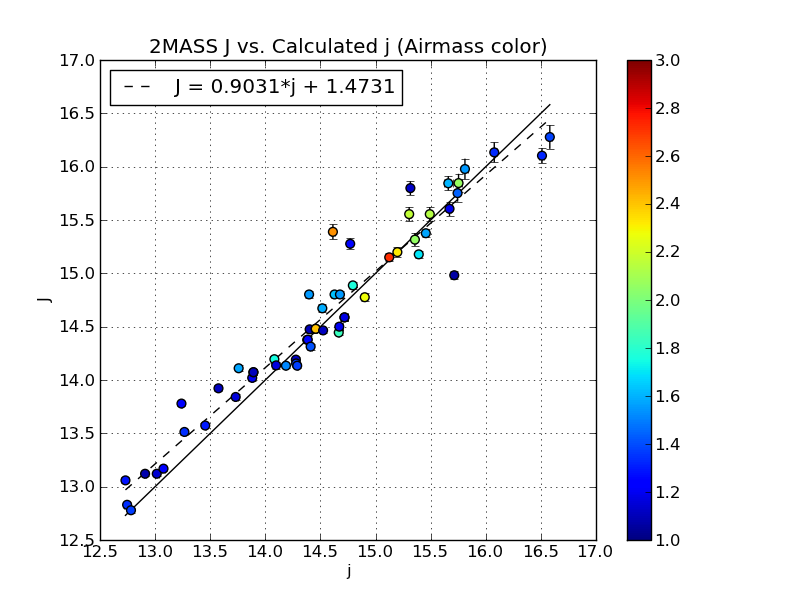 2MASS apparent J magnitudes vs. my calculated apparent j magnitudes for 67 brown dwarfs. 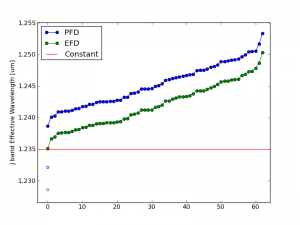 The solid black line is for perfect agreement and the dashed line is a best fit of the data. 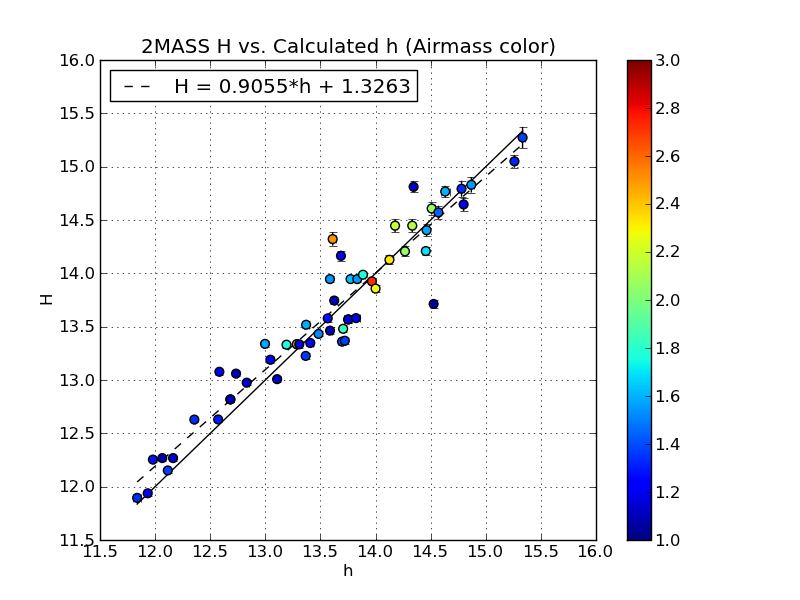 2MASS apparent H magnitudes vs. my calculated apparent h magnitudes for 67 brown dwarfs. The solid black line is for perfect agreement and the dashed line is a best fit of the data. I whittled down my sample of 875 to only those objects with flux units and airmass values taken at Mauna Kea so that I could use the same extinction coefficient and make sure they are all in the same units of [erg s-1 cm-2 A-1]. Then I pulled the 2MASS catalog J and H magnitudes with uncertainties for these remaining objects and plotted them against my calculated values with uncertainties. To the left are the plots of the 67 objects that fit the selection criteria in J-band (above) and H-band (below). Though it's not the biggest sample, the deviation of the best fit line from unity suggests I'm off by a factor of 0.9 from the 2MASS catalog value across the board. But more worrisome is the fact that most of the calculated magnitudes are not within the errors of the 2MASS magnitudes. This deviation ranges from very good agreement of a few thousandths of a magnitude up to the worst offenders of about 0.8 mags. The effective wavelength of a filter for narrow band photometry can easily be approximated by a constant and just looked up when needed. For broad band photometry, however, the width of the filter and the amount of flux in the band being measured actually come into play. Where is the scalar filter throughput and is the flux density in units of [erg s-1 cm-2 A-1] or [photons s-1 cm-2 A-1] depending upon whether you are using an energy measuring or a photon counting detector, respectively. Effective wavelength values for the 2MASS J-band filter. 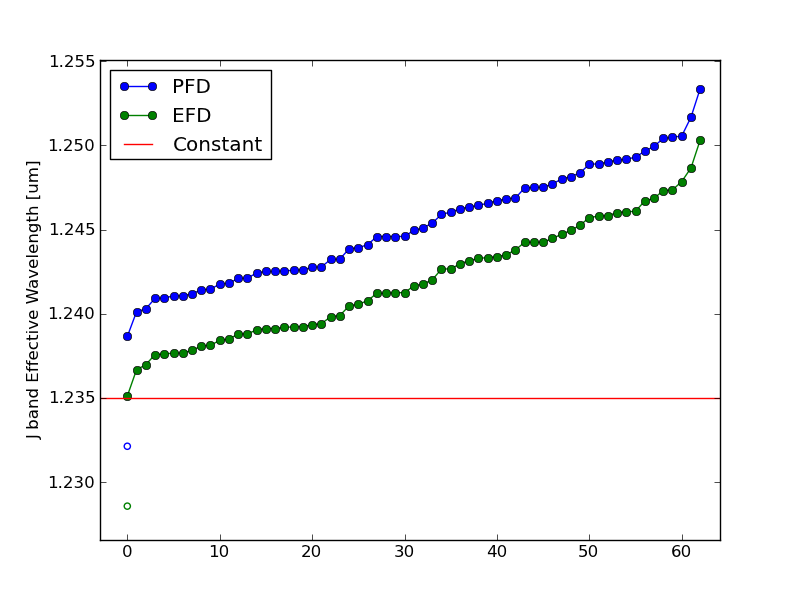 Blue and green circles indicate lambda calculated using photon flux densities (PFD) and energy flux densities (EFD) respectively. Filled circles are for 67 confirmed brown dwarfs. Open circles are for Vega. 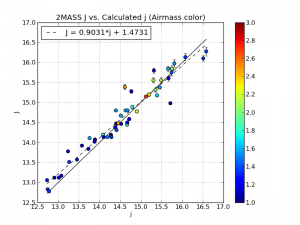 The red line on the plot shows the specified value given by 2MASS. 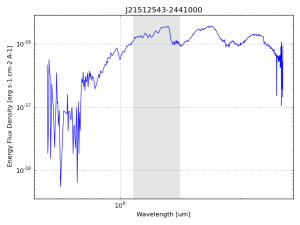 For fainter objects like brown dwarfs (filled circles), the calculated effective wavelength of the J-band filter can shift redward by as much as 150 angstroms. Vega (open circles) shifts it blueward by about 30 angstroms. The difference is small but measurable and demonstrates the dependence of the filter width, source spectrum, and detector type on the effective wavelength while doing broad band photometry.